Bill loved the food at NWH. I went to Dr. Grossman in excruciating pain in my right knee-- limping- barely able to walk. Dr. Grossman did the partial knee replacement in June 2015- went into hospital on Monday morning- out of the hospital Tuesday am. I was told by the PT in the hospital to use a walker and cane for assistance- I was shown how to go up and down the stairs before I left NWH. I left the hospital in no pain- and through the recovery had no pain- I did not once take a pain pill- I did not use the walker or cane at any time during recovery. I started PT on Thursday of that week- they had me riding a bike and ball and table exercise from the start. While in PT another patient from a different doctor who had regular partial knee replacement- not robotic- was riding the bike next to me. While I was doing 12 min and riding at a good pace after three weeks- she was barely able to turn the pedal on the bike and was walking with a single crutch. She wanted to know if she would ever be able to ride the bike like me and walk without pain. I did feel so bad for her but glad for myself that mine was done by Dr. Grossman robotically. I ride my bike at least 5 miles per day- walking and exercising without any pain. I am able to bend my knee better than before surgery. Thank you to Dr. Grossman and the team for all they have done for me!- Regina B. My experience and results following my anterior approach to total hip replacement (THR) with Dr. Eric Grossman were nothing short of spectacular. Being a physical therapist and having worked in the field for 34 years, specializing in Orthopaedics, I have treated thousands of patients with THR reconstructions performed by a variety of physicians. One of the greatest misnomers my patients have living in Westchester and Putnam counties is that they must travel to NYC to obtain the best quality THR. This belief could not be further from the truth. The reason I chose Dr. Grossman was based on the results I saw in his patients treated by me post operatively. Pain levels were minimal to none. Range of motion, excellent. And return to function, superior. Outcomes exceeded the patients I saw from that famous NYC hospital we see being hawked as the platinum standard of orthopaedic surgery. My result was exactly what I had hoped for. I was ambulatory 8 hours post-op, returned home the next day, and was able to walk and sleep comfortably for the first time in over a year and a half. I returned to work full time in 10 days without a gait aide. My patients were amazed to see me back at work so soon and move about so comfortably. In closing it would be incomplete if bedside manner was not mentioned. One often hears a physician is a great surgeon but has no bedside manner. That has always disturbed me because if bedside manner is lacking, the physicianâ€™s toolbag is half full, unless of course he is a pathologist or medical examiner. Dr. Grossman is conversational, empathetic, and makes on feel as if he has a personal relationship with you. I welcome any inquiries from prospective THR patients regarding my care. - Jim W.
From the moment I met Dr. Eric Grossman, I felt confident that he was the right surgeon for me! He is kind, compassionate and the best surgeon I have ever had. Dr. Grossman is a genius & a miracle worker. His staff is wonderful, considerate, caring and took the time to listen to my needs. Thank you Dr. Grossman for giving me a strong leg to stand on! I am forever thankful. - Teresa S.
I started to experience hip pain in June of 2008. Xrays revealed moderate osteoarthritis. In the summer of 2011, I had an Xray-guided injection of a corticosteroid at NWH, which gave me some relief. But by December, I was using a cane to relieve some weight from my hip. In January, 2012, I decided to undergo hip replacement surgery. I saw two orthopedists affiliated with NWH and one associated with Hospital for Special Surgery. Given my family's very positive experiences with NWH during the 40 years we have lived in Mt. Kisco, it was no contest. I would have the surgery at NWH. I selected Dr. Eric Grossman to be my surgeon, because he performed the anterior approach technique, very clearly explained what was involved, and was interested in me and my own career. He treated me more like a professional colleague than a patient. The NWH education session prior to the surgery was very well done, answered all my questions, and gave me great confidence that I would be in good hands. The actual surgery took place on 8/8/12. The nurses, surgeon, and anesthesiologist all made me feel comfortable and confident, while preparing me. Coming out of anesthesia, nurses were there to check on me, explain what was still attached to my body, and see that I was safely moved from the surgery recovery room to the room where I would spend the next few days. I felt very little pain or discomfort. It was almost like being in a hotel. Over the next several days, Dr. Grossman, nurses, and physical therapists looked after me and met all my needs. The day after surgery I was actually walking up some stairs, accompanied by a physical therapist. There were no unpleasant or unexpected incidents, other than my surprise that I was walking up and down an entire flight of stairs two days after surgery. Everyone I encountered knew what he/she was doing, was courteous without being condescending, and had my full trust. It's hard for me to imagine a better hospital stay for the type of surgery I had undergone. Three days after surgery, I was discharged and driven home by my wife. I did not have to go to a rehab facility. Some physical therapists came to my home over the next two weeks, showing me how to build strength in my affected muscles and ensure that I was increasing my range of motion. Approximately two weeks after discharge, I saw Dr. Grossman, who gave me the OK to drive car by myself. The entire experience was as good as I can imagine. All my needs were met. Your staff and facility were terrific. I would not hesitate to recommend NWH and Dr. Grossman to anyone needing orthopedic surgery. Having lost 25 lbs starting in January, 2012, 7 months prior to my surgery, exercising regularly at a fitness center prior to and after surgery, and playing tennis again with no pain, I believe that I am in better shape than at any time in the past two decades. 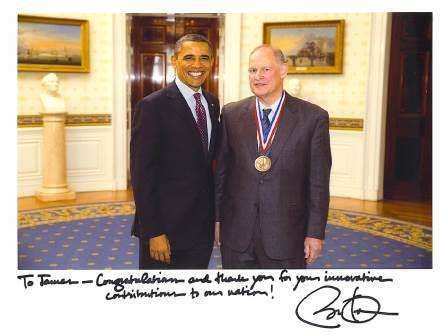 Thanks to Dr. Grossman and NWH, I was able to proudly attend a ceremony at the White House on February 1, 2013, to receive the National Medal of Technology and Innovation from President Obama. I walked upright with no hint of disability and could stand next to the President in total comfort, as shown in the accompanying photo. Keep up the good work! !- James W.
My name is William. I had a total hip replacement on 10/24/12. The surgery was performed by Dr. Eric Grossman. He used the "ANTERIOR" procedure. If possible,it is the only way to go!!! Your staff had me taking my first steps only 2-1/2 hrs ater the procedure. The next morning I was taking a slow walk up and down the hall with one of your wonderful staff on each side of me. The following day , I was off to the Waterview Rehab. facility for 5 days of rehab. I continued my rehab. here in Mt. Kisco for about 4 weeks. The surgery was so successful, that I did not need a cane after the 9th day. Dr. Grossman does not use stiches or staples, he uses glue. My scar looks like the surgery was performed by Dr. Doug Roth, my Plastic surgeon. With the Anterior approach, their are no "HIP RESTRAINTS". The hip can not dislocate. By the middle of January, we were off to our home in Naples, Florida. I continued my walking, exercising and swimming while in Florida. Within 4 months, I was at about 80%. I am now at 100%. Eric gave me my old way of life back. He is still following up on my progress with x-rays and office visits. He is a credit to his Profession, your Hospital and the Mt. Kisco Medical Group. Did I tell you that I will be 79 years old on January 11th? Respectfully submitted, Bill-William M.
I write to you for the best of reasons. On April 10, 2013, Dr. Eric Grossman performed hip replacement surgery on me. It was not without some hesitation that I elected to have a "local" surgeon at a "local" hospital do this procedure, rather than a physician associated with, for example, Hospital for Special Surgery. Thus far, my choice was the right one. Insofar as you are concerned, i commend your staff on the 4th floor. From check-in to departure, I was treated with great care, patience and understanding. it made my post-op recovery easier and more pleasant. Too many institutions have lost sight of caring about the customer. You have not. My hat is off to you (and, I should add, Dr. Grossman's work).-Derek W.
I was taken in immediately and Dr. Grossman entered shortly after. All my questions were answered. He explained all my options. I was very comfortable during the visit. My experience at the hospital was wonderful. The doctor and his staff was wonderful, I can't say anything derogatory about anyone there, they were all very accommodating, the listened, and I was very, very pleased. They made me very, very comfortable and I have no hesitations of recommending any...any of them. Great! I liked the written material I received re: my upcoming operation. One suggestion I have is to have been more informed as to where the hip pain may be. I needed to go to the internet to learn that in needing a replacement hip one may have radiant pain reflected in other areas beside the hip. I suppose this is common sense and if so this is something I must lack. Just a satisfactory experience. I hope the procedure goes as well (new hip replacement) !!! 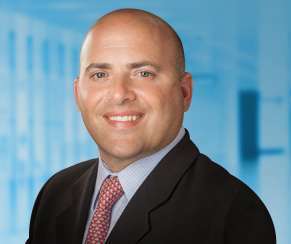 Dr. Grossman is very caring, compassionate, and understanding of my knee issues and willing to help me be better. Dr Grossman is wonderful I have recommended him to so many people. He explains every thing very well and takes so much time with you. After a very short wait time (always greatly appreciated!) Dr. Grossman explained everything to me and answered my many questions, taking as much time as I needed. I feel completely confident that I'm in good hands under his care. Dr. Grossman is caring and while under time pressure, took the time with me that I needed. Even more impressive is that this morning when I had a question about my wound care and asked him through Force, he responded to me within 3 minutes! I have the utmost respect and appreciation for Dr. Grossman and his staff. Always greeting you with a smile and getting you in and out without any delays. I am extremely pleased with this physician and his staff I have already recommended him to my friends. Dr. Grossman was kind, caring and competent. I feel confident that he will be able to address my knee pain issues once further testing is completed. I would tell them, to come here for great medical care, when they need it. Dr. Grossman is a very good dr. He listens to your concerns. Asks questions to fine tune your treatment. Couldn't be happier with him. The staff is courteous and helpful. I tell my family and friends that this provider has interest in me as a patient and is very personable. This provider also believes in taking non-surgical approaches first as a course of healing before suggesting surgery as a last resort; in my opinion. This provider is a credit to his profession. Dr. Grossman is fabulous. Extremely knowledgeable and compassionate. It was great to finally get answers to my knee pain and insight as to what can be done to alleviate the pain and repair potential damage. I look forward to seeing him again after my MRI to further discuss. This doctor and staff are a top shelf group. They encourage questions and explained the procedure in detail. I have already recommended this group to friends. A very honest and straightforward communicator. In addition, I am quite well satisfied with the results of my surgery. The doctor is very good when treating patients, he is very attentive to my needs. Highly respect this doctor. Always explains everything in easy to understand terms. Very happy with my visit to dr grossman! Very informative and helpful. Excellent surgeon. Very good results so far. Takes time to explain the procedure. I HAVE SEEN DR. GROSSMAN SEVERAL TIMES FOR VARIOUS INJURIES. HE ALSO PERFORMED MY HIP REPLACEMENT. I HOLD HIM IN HIGHEST REGARD FOR HIS MANNER AND EXPERTISE AND HAVE RECOMMENDED HIM TO OTHERS. Dr. Grossman is an excellent doctor who listened to my concerns and provided the appropriate advice. I especially appreciated that he had me look at my x-ray so I could understand what was happening with my painful shoulder. My doctor is very good and I have great confidence in him. Go to Dr. Grossman for orthopedics. Excellent doctor and is very easy to talk to and understand. Dr. Grossman is personable and took caution in caring for our son when he broke his wrist. He is patient with questions and I trust that he took good care of my son over the course of his treatment. Definately the doctor for your hip replacement. Share experience about the office visit, not spine surgery, which I never had. The medical service is excellent. the staff from provider to receptionist are top of the line. I had a good experience with Dr. Grossman and the x-ray department and the reception that scheduled my surgery. excellent experience, very knowledgeable, thorough physician and his staff! Dr. Grossman and everyone in the Ortho office have been fantastic. Very happy with the care and attention. I found Dr Grossman to listen carefully to the reason I had scheduled the app't. He then explained my problem and also shared the screens illustrating the issues with my hip. His explanation was clear, informative and easily understood. He also advised how to deal with the issue should it reoccur and encouraged me to make another app't if the problem repeated and was not resolved. My experience with Dr. Grossman has been excellent. This dr. was super. Showed great concern for my welfare. Great guy! If you're interested in submitting a testimonial for Eric L. Grossman, MD, Please use the form below to do so.